Yamaha RX-V2065 review | What Hi-Fi? Unbox the RX-V2065 and you may wonder where all your cash has been spent. As far as looks are concerned, there isn't much to differentiate this home cinema amp from Yamaha's budget models costing half as much. Yet, take a look at the comprehensive list of features and you'll see clearly how this machine distances itself from Yamaha's cheaper models. The RX-V2065 has dual HDMI outputs, a front-mounted HDMI input, network and internet radio connectivity, as well as Zone 2 and 3 functionality. 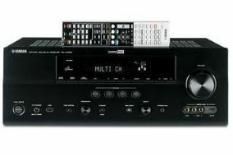 These are all supplementary to standard features you'd expect at this price point, such as 1080p upscaling, automatic speaker calibration, HDMI passthrough while in standby, and a set of multichannel inputs and pre-outs. The YPAO speaker calibration system takes accurate readings, although we did have to lower the level for the subwoofer in our reference speaker package. The menu system is modern and attractive, although navigating can be a little frustrating at times. Spin Terminator Salvation, and the Yamaha produces a dramatic, authoritative sound. Yamaha amps are renowned for their steering capabilities and the '2065 is no exception. As the Resistance's A-10 aircraft try to evade Skynet, the planes soar between channels, enveloping the listener. When all the commotion dies down, the Yamaha proves it can also handle subtle dynamic shifts, although rivals have the edge in terms of outright resolution. Dialogue sounds clear and natural, but there is a hint of hardness in the highest frequencies, which extends to two-channel performance, too. Such was the ability of its predecessor, the RX-V1900, perhaps we were expecting a bit more from Yamaha, but there's no doubt the '2065 is a gifted amp.